Austin is great because so many people who live and work centrally are choosing bikes or feet as both their primary transportation and favorite recreation equipment. People love to cycle and run here. However, this also concentrates outdoor recreation and exercise participation into a narrow area. Most outdoor activity for those living or working downtown is focused between Mopac (Highway 1) in the west and Interstate 35 in the east. Stereotypically, anything west of Mopac puts you into master-planned communities; east of I-35 puts you into the gentrification zone; and in between those is Downtown (capital D), and that’s the only area many visitors see. Historically, the sharpest divide has followed the I-35 corridor, separating east from central and west Austin. There are deep-seated reasons for this, but suffice it to say that Austin has been long overdue for unifying its zones, and little things have been happening to make that possible. One of those is the Boardwalk. 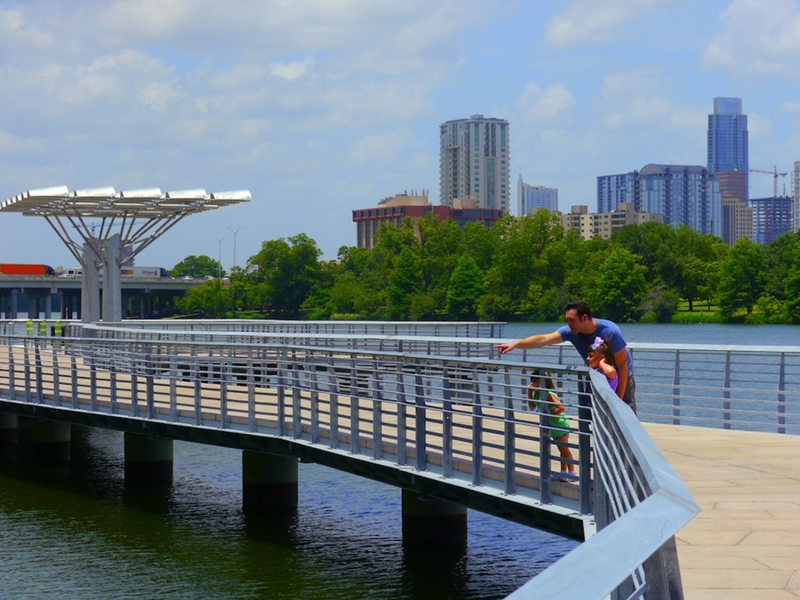 Austin has just opened its Boardwalk Trail on Lady Bird Lake, on the east side of town. (It’s so new that, as of this writing, it still does not have any official signage marking its entrance and its web page still has not been updated to reflect its opening). 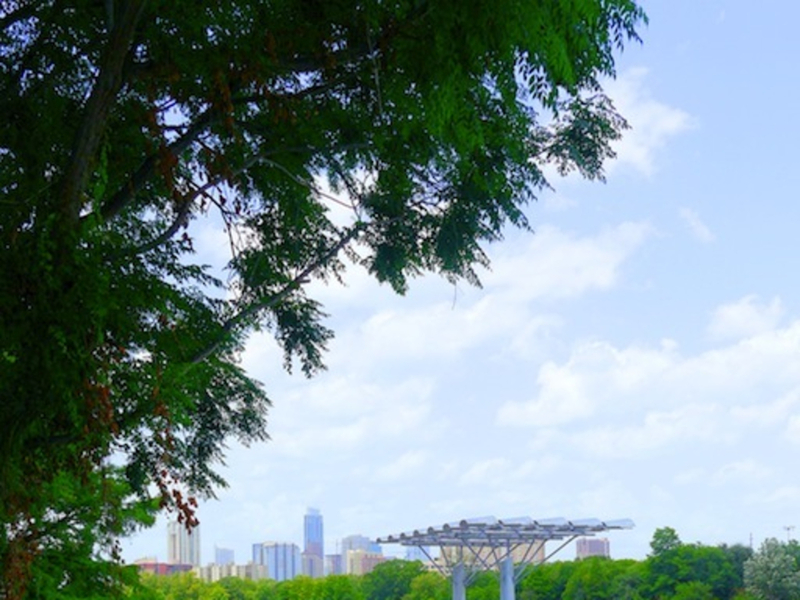 It has been too long of a wait to give those on the east side an easier, direct connection to the beautiful recreation around central Lady Bird Lake, and in reverse, to give downtown-dwellers more connection to the east side, including its often-ignored natural beauty. 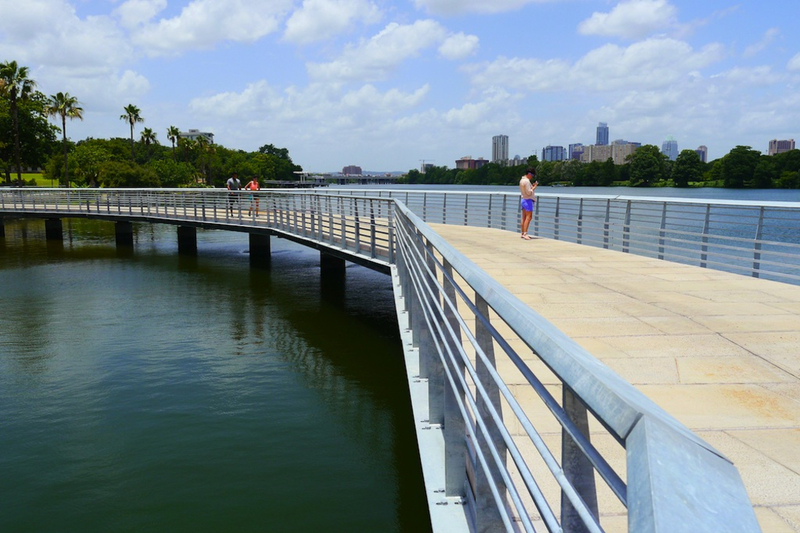 With most downtown outdoor recreation focused around Lady Bird Lake, and more specifically, on the Butler Hike and Bike trail , it’s nice to finally have an extension of that trail on the east side. The Butler hike and bike trail is a 10-mile loop around the lake, but until now, it had this annoying gap on the east side of I-35. “The Butler trail was built in the 1970s, and there was a detour on the south shore because of private property and steep terrain,” says David Taylor, Project Manager for the Boardwalk. So the gap was there because the real estate along the shore was occupied, too expensive to buy, and too expensive to make suitable for a trail. It’s still partially occupied, but the city finally put into action a proposal to just build around that property, out over the water. “The city and The Trail Foundation teamed up to create this link,” adds Taylor. 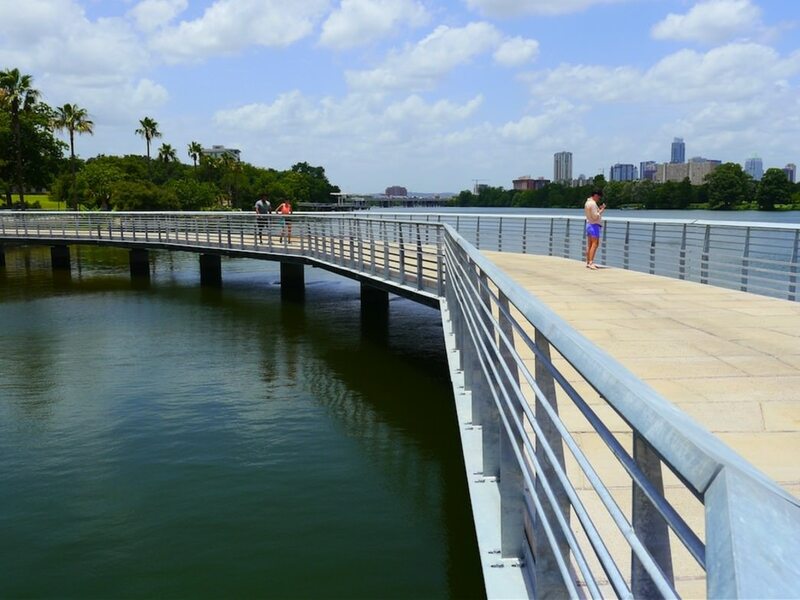 “Now, after years of planning and work, we have built a safe and accessible link in the hike and bike trail.” And now, Austin has an uninterrupted trail of over 10 miles around its central lake. History, politics and official statements aside, the most important thing about this boardwalk is that… well, it’s just fun, and good. It’s yet another nice, beautiful way to enjoy the outdoors in Austin, and it reflects the fact that Austin cares about giving people more ways to get a little closer to nature. She didn’t notice the downtown skyline in the background. She gave no comment about the divide between the city’s zones. She paid no attention to the condos that the boardwalk’s trail steered around. She didn’t see the traffic congested on the nearby I-35 bridge. She just saw the water and the turtles. And isn’t that why we all get outside? To see the things we don’t see enough. I’m glad that the new Boardwalk gives more people that chance. 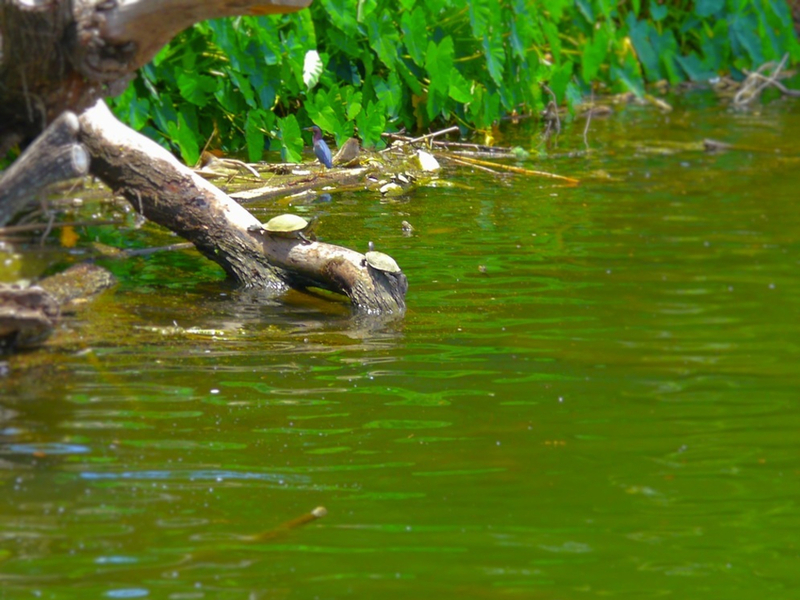 Other Activities on the Boardwalk: In addition to hiking, running and cycling, you can also rent paddleboards, from Paddle Zen, in front of AMLI South Shore apartments on the trail. They’re $15/hour on weekdays, and $20 on weekends. Logistics: The best parking spots for the Boardwalk are all along South Lakeshore Boulevard, which is just east of I-35 between East Riverside Drive and South Pleasant Valley Road. The trailhead is next door to (just east of) Lakeview Apartments. Entrance is free.